1. Preheat your oven to 425°F (210°C). Place shrimp in a large bowl; add oil, garlic, lemon, honey, chili pepper flakes, mustard and cilantro. Add tomatoes and zucchini, toss to coat well and let rest for about 15 to 30 minutes. 2. Tear off four 16-inch sheets of foil and place over a rimmed baking sheet, one foil at a time. 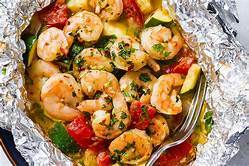 Using a spoon, arrange 1/4 of the shrimp and veggies mixture in the middle of the foil. Top with a tablespoon of the marinade in the bottom of the bowl and place a pat of butter. 3. Seal the foil packet by folding over one end to meet the corners of the other; continue to tightly fold the open edge to form a seal. Repeat the process with remaining foil packets. Arrange on the baking sheet and bake for 15-20 minutes.